When people think of great pairs to cook with food, the thought of acorn squash and apples may seem an unlikely pair. Contrarily, the two items make a delicious pairing for any occasion. Apples help to enhance the sweet quality of acorn squash. Acorn squash is noted for its orange accents, and dark, green, tough skin. The acorn squash is pointed towards the bottom and may remind some of the shape of a pumpkin. This squash is classed as a winter squash and has beneficial dietary qualities like vitamin c, carotenes (great against cancer), vitamin b1, lots of dietary fiber and folic acid as well. Here is a recipe you can combine apples and acorn squash to make the entire family happy. I want to do this! Rinse and wash the skin of the acorn squash. Slice the stems off. Remove the point on the bottom end. 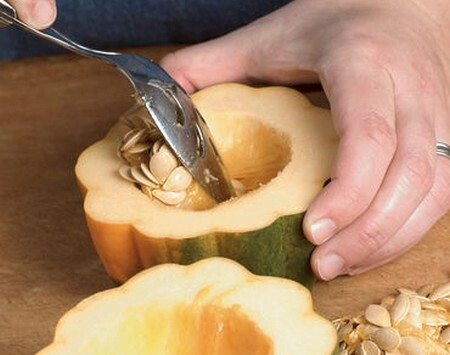 Cut the squash in two halves and take out the pulp using a spoon. Now was the inside hull of the squash thoroughly. Set your oven to 400 degrees. Allow to preheat. Wash the skin of an apple and dice it into even chunks. Steam the apple until they are firm but soft. Brush on some oil inside a baking dish. Coat the squash using canola oil. Do this for both halves. Position the squash skin side up in the dish and place in the preheated oven. In a saucepan melt some butter and add cinnamon. Add walnuts and apple chucks to the mixture. Sautee the mix gently. 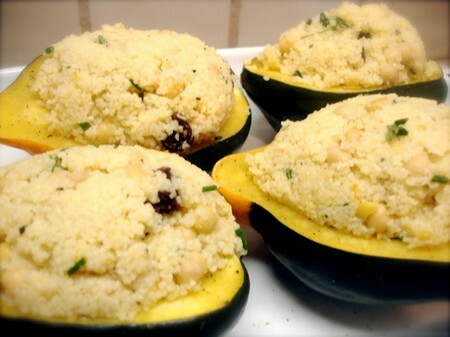 Allow the squash to bake for 25 minute. The perimeter of the squash should be browned. Dash the squash with salt. Put the apple mixture in the hull of the acorn. Put the acorn squash into the over for 20 more minutes. The apples on top will have crisped and the squash will slice easily. Makes a fantastic substitute for a side of potatoes with any meal. Acorn squash has Vitamin A, Vitamin C, Calcium, and Magnesium. A whole acorn squash is a mere 172 calories! Acorn squash by itself has less than 1 mg of fat. Acorn squash is best during fall and winter, but is not hard to buy at the grocery all year. If placed inside a paper bag, an acorn squash can be refrigerated for a week.